art, drawing, painting, criticism, mailart, poetry, museums, contemporary art, figurative art, etc. 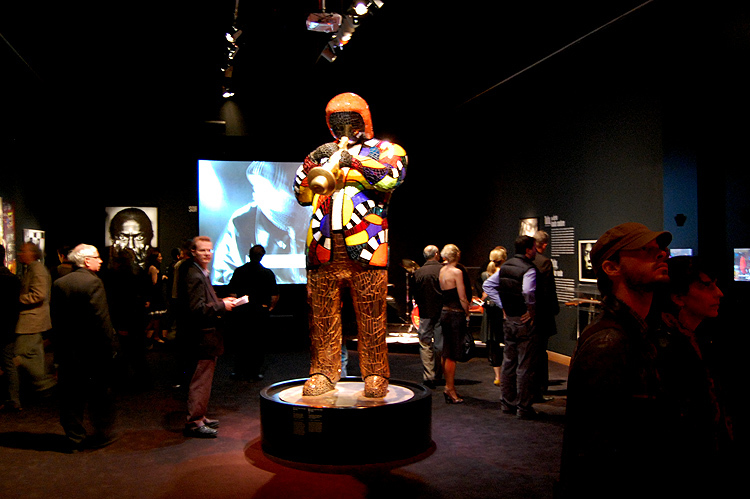 Opening last night in Montreal, this heady, Miles Davis adulating exhibition, “We Want Miles” is stuffed with everything from music scores, album covers and publicity photos to paintings by Basquiat and Miles Davis, along with a monumental sculpture of Miles by Niki de Saint Phalle. The excess of information, however, is offset by the fact that the show is free [initial I thought it was free like the previous Yoko Ono – Lennon “Imagine” exhibit at MBAM] and makes for easy repeat visits. 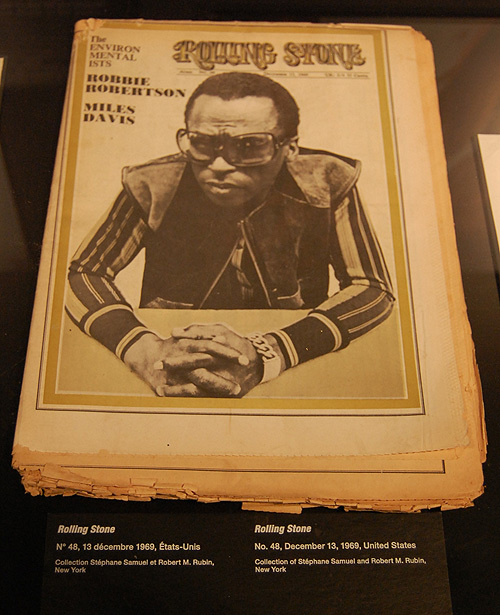 Those who want to read each blurb detailing the progression of Miles Davis’s life and career as a musician will have a chance. 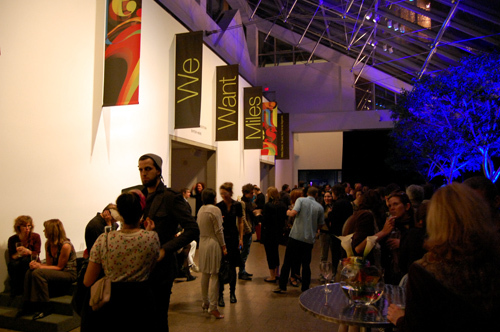 The house was packed with more Montreal and international musicians than I have ever seen at the Montreal Museum of Fine Art. 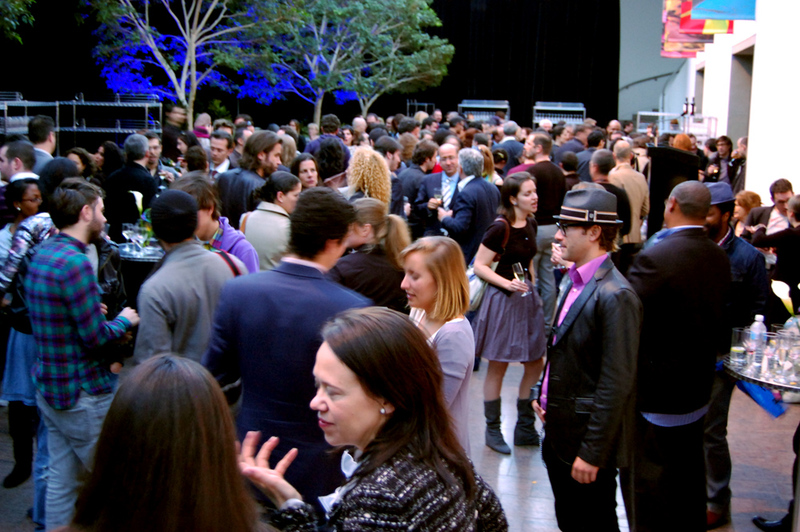 Spirits were high, a live trumpeter played and drinks and music were flowing. While I snapped a few photos as posted below, I thought about how the curator might manage to tie in Miles’ career as a visual artist with his music. Let me first highlight the display on a large viewing screen of what I think is the single most beautiful sequence shown at the exhibition, where music meets visual art, ie cinema. 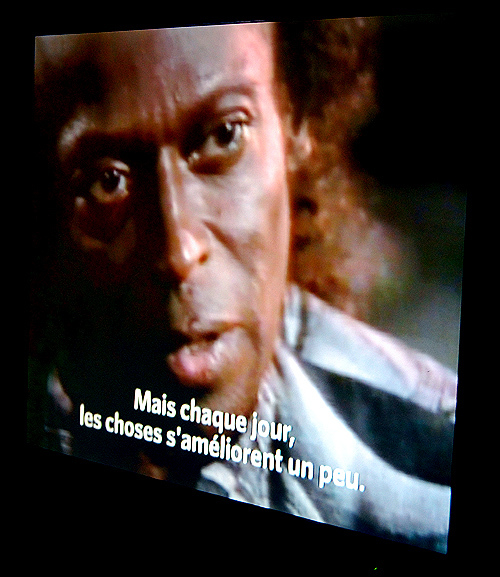 Miles Davis plays the sound track in this clip in what some have called the “loneliest trumpet solo ever played” … or at least the loneliest in cinema. 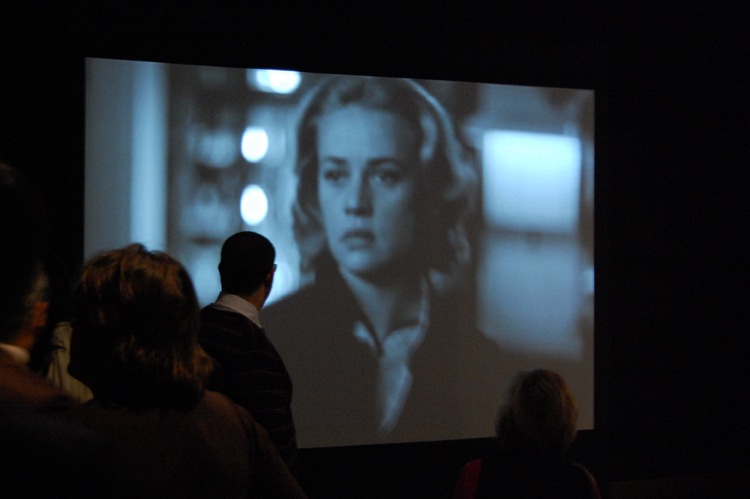 Its a sequence in which a character played by Jeanne Moreau looks for her lover in the streets of Paris. 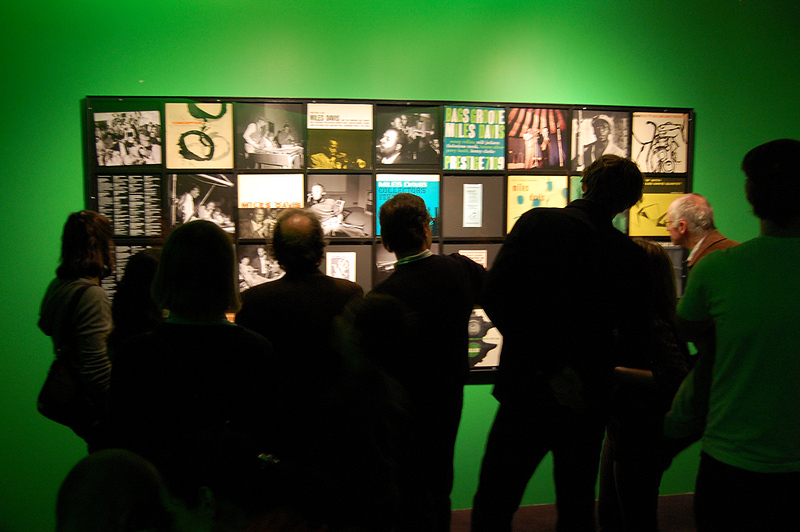 It is shown on a large screen along the wall of the exhibit as in the photo above. 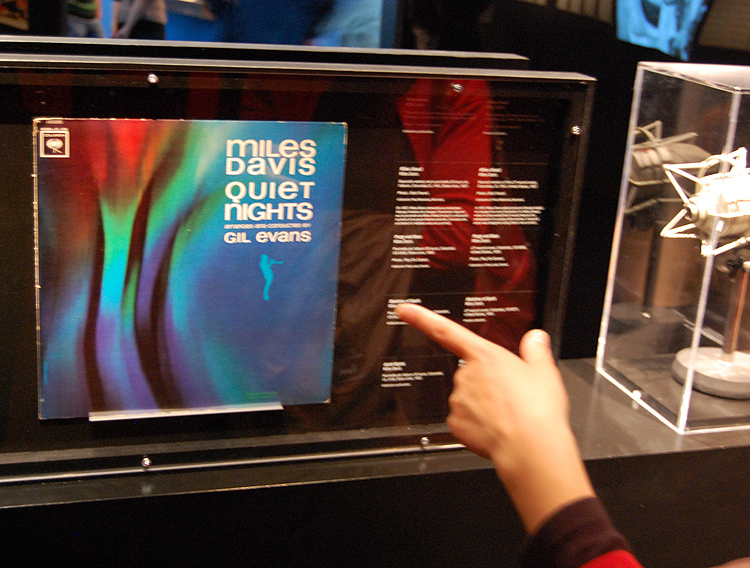 Below you can see the most of the clip shown in the exhibit and hear Miles’ haunting trumpet solo as part of the film score. 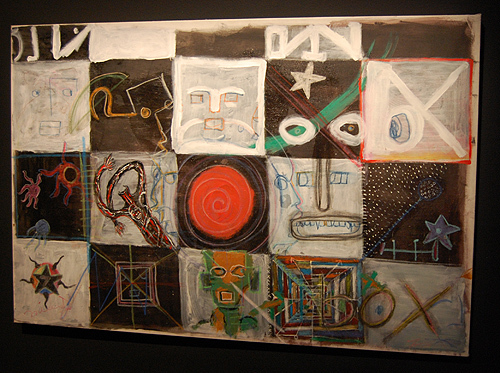 Cinema soundtracks aside, the work of visual artists comes up to highlight its relationship to Miles process from musical to paint. 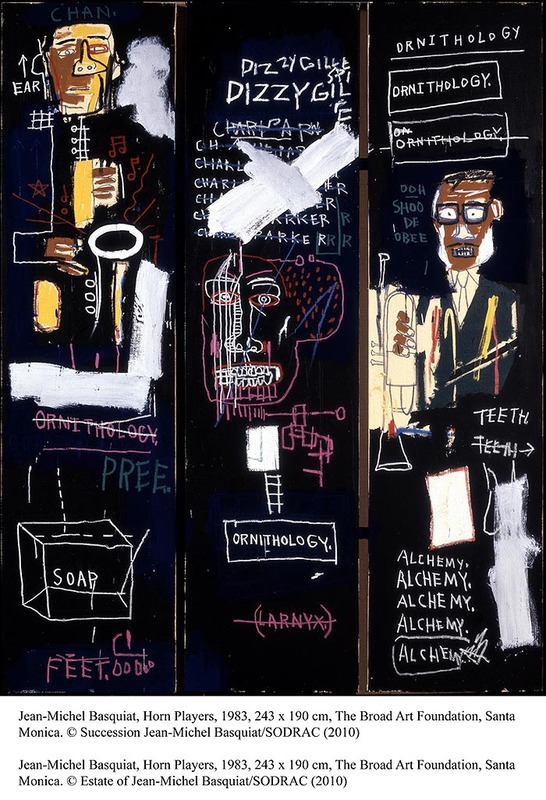 Much was made in the press releases about the Basquiat pictures which were inspired by the jazz greats and in turn inspired Miles to paint or draw nearly everyday during a particular period of later in Miles’ life; making time to do so even while on tour. Official image of *Bird of Paradise* from the museum website. 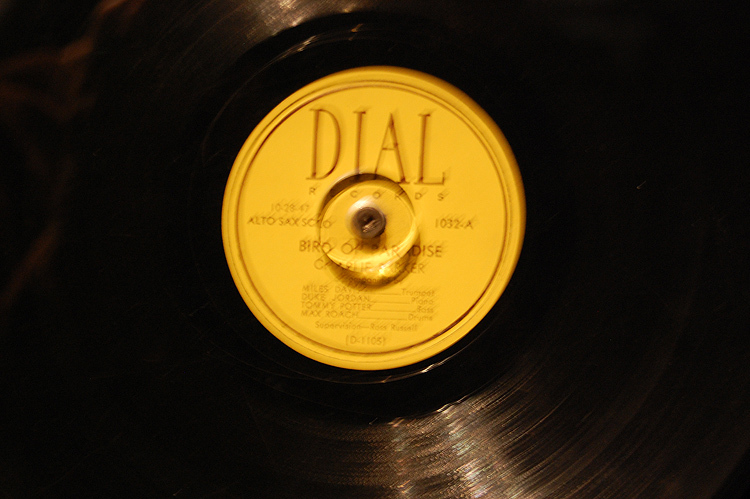 The record on display as reference to the above painting. 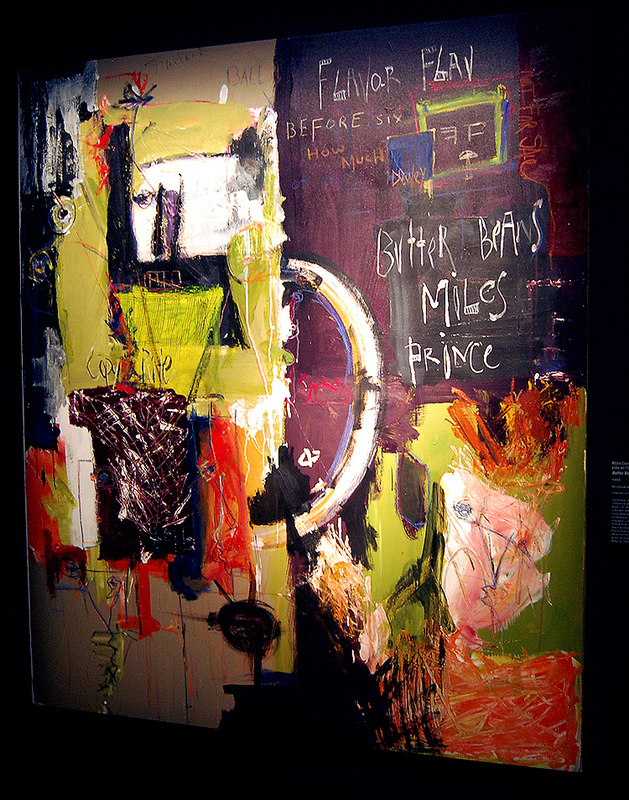 While I appreciate Miles working through his creative process, his painting is largely derivative and not as compelling as the drama of his life itself, particularly his struggles with music production, drug addiction and difficult and at times abusive relationships. His struggles with heroin simply highlighted those tragedies. Miles a few hours before a drug arrest. Rita was touched by this photo and the look on Miles face. 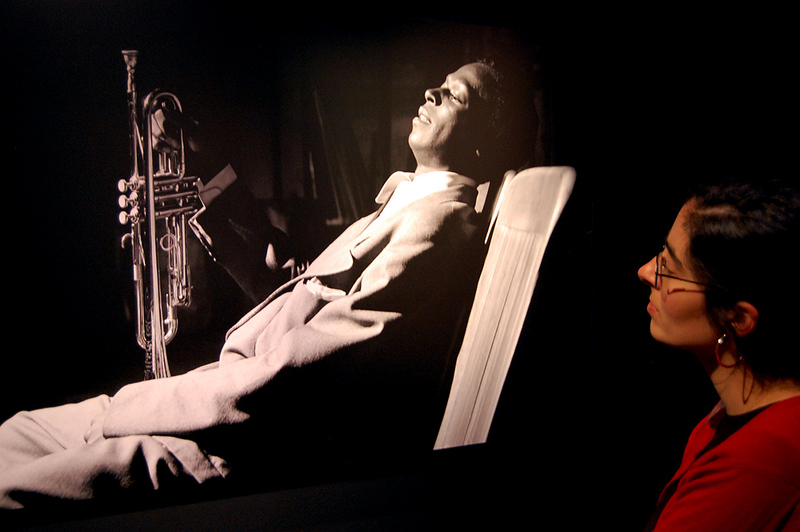 The tragedy of a generation of musicians [Charlie Parker was also addicted to heroin] whose lives where devastated by heroin and other drug use. The next photo shows Miles locking himself in at his parents place and going “cold turkey” to shake the biological addiction to the drugs. 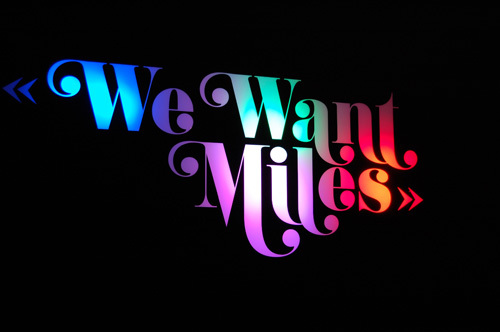 Miles goes cold turkey and comes out clean for some years. 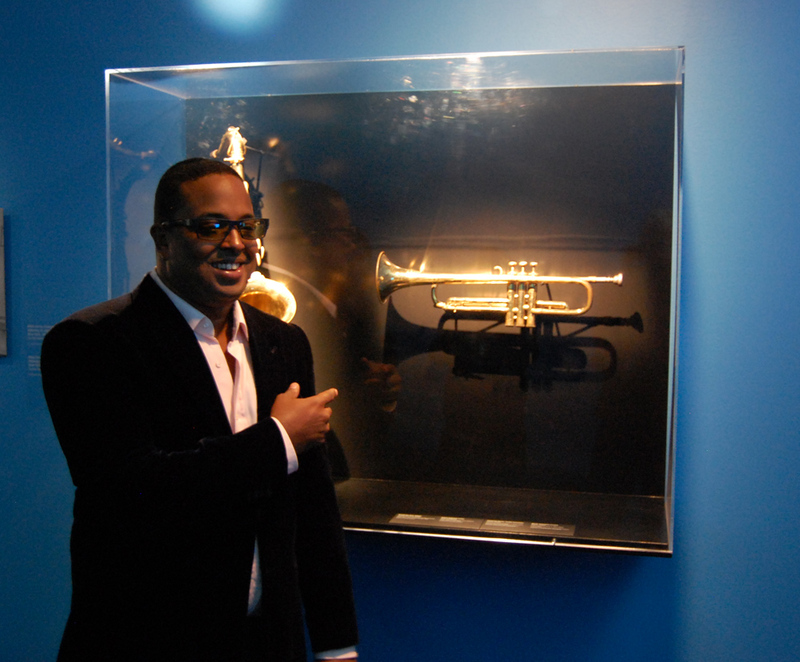 Miles Davis's son Erin Davis points at a trumpet played by his father. 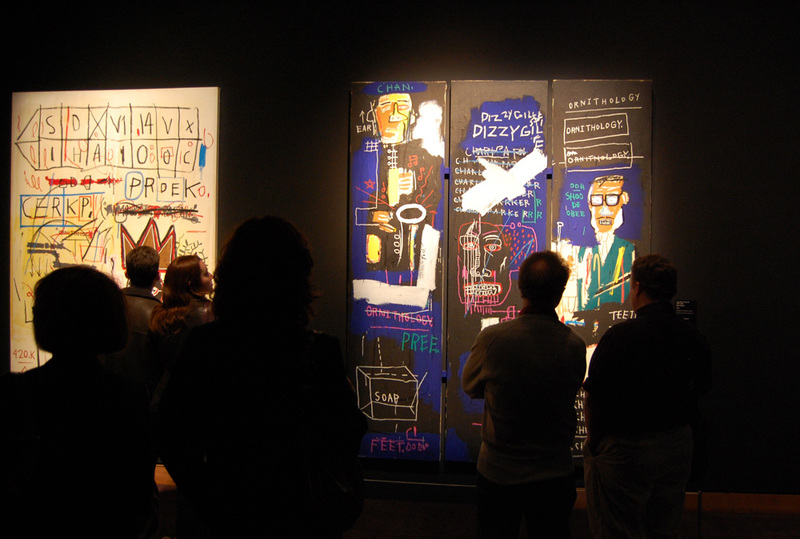 I asked Erin Davis why there was not more visual artwork by Miles on display. He said much of it was sold and is now in private collections. Much that was on display was part of the Davis estate. He did say there are lithographs held by “Bag One Arts” which is the same business that represents Yoko One and John Lennon’s work. I couldn’t find any actual images of prints online. 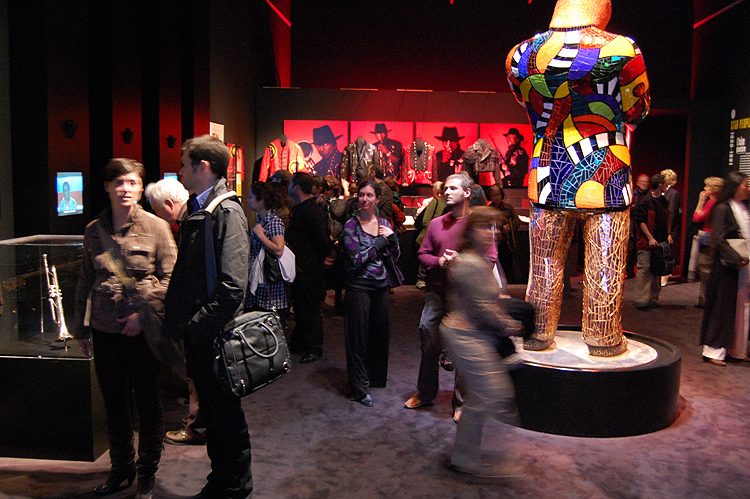 Erin did visit the exhibition when it was in Paris. 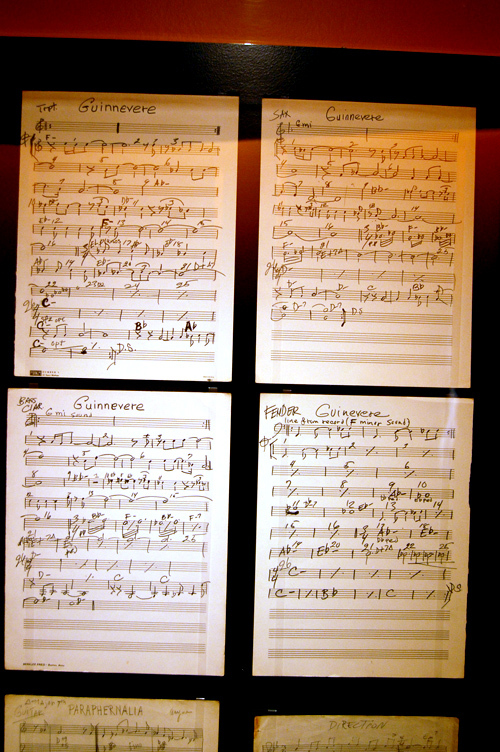 He is presently writing music for a film score and appeared to be good spirits and content with the show at the Montreal Museum of Fine Art. 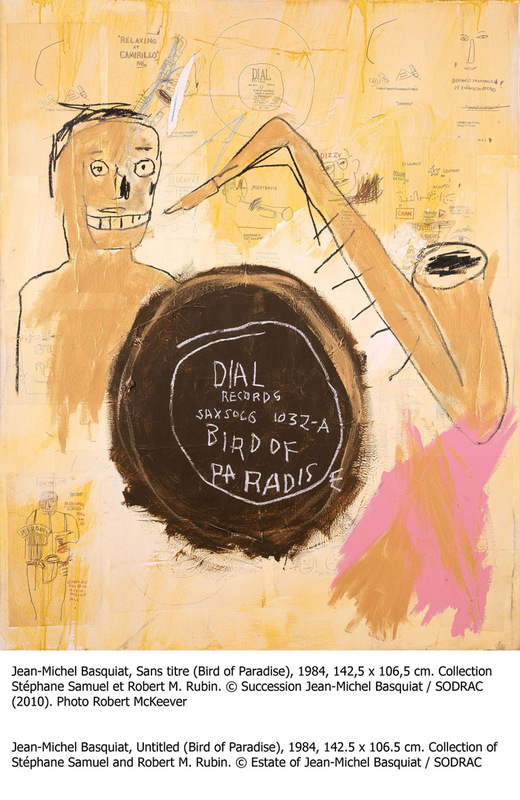 While I was excited about the music, photos, video interviews and objects, I did feel that the whole relationship between the actual painting and drawing and what it meant to Miles in terms of his music, and that in terms of any relationship he had with Basquiat was poorly explored. Similar links could have made with his fashion and clothing. This may have been in part a question of availability of the artwork, but it did leave me feeling that the grasp Miles had on visual art was superficial at best, though I may be wrong. 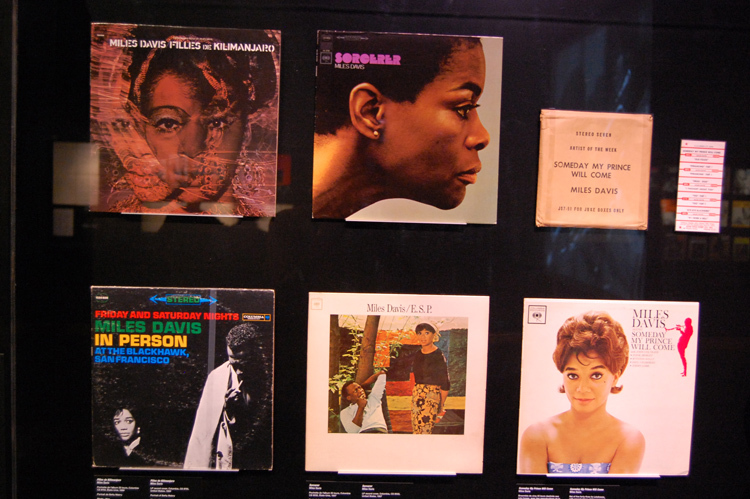 In part the sheer weight of his musical genius is so difficult to counterbalance with art from other disciplines. 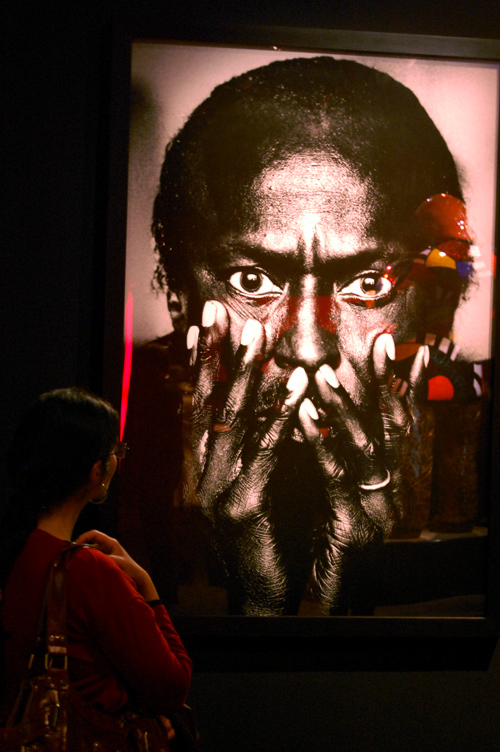 Miles would have needed create work in the visual arts that was downright stunning not to be eclipsed by the monumental achievement of his music. 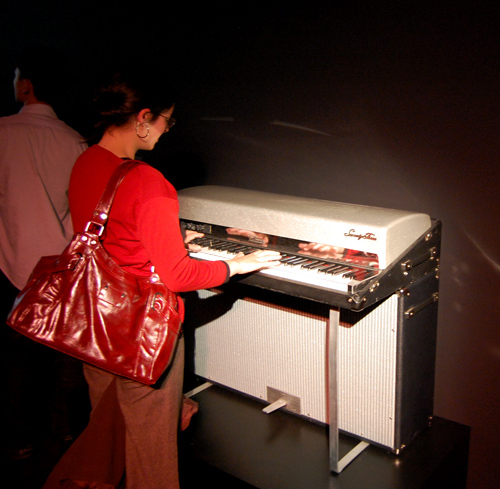 In which case, perhaps writing film scores by improvisation, watching as the film passes by [somewhat in the tradition of the pianists who improvised at silent movies] is the most intimate link Miles successfully formed between visual art and music. 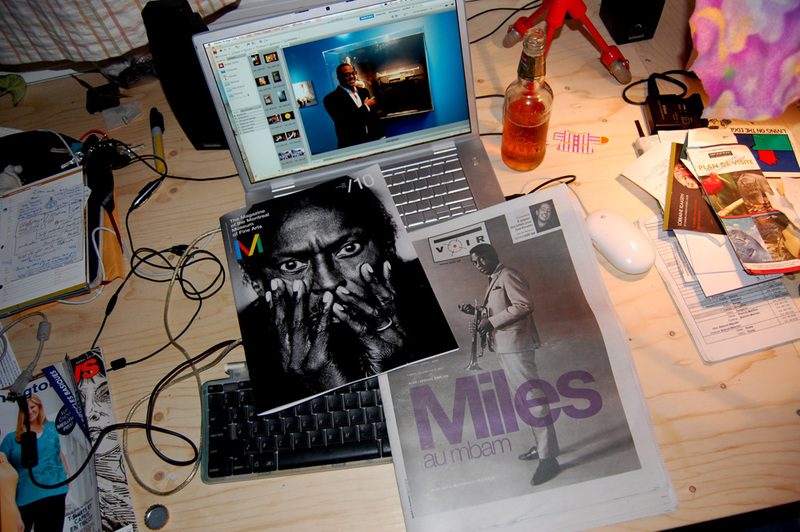 Please leave comments below if you have anything you have to help me understand more about Miles or other musicians who work in the visual arts, particularly in terms of a strong relationship between the two in their creative process. 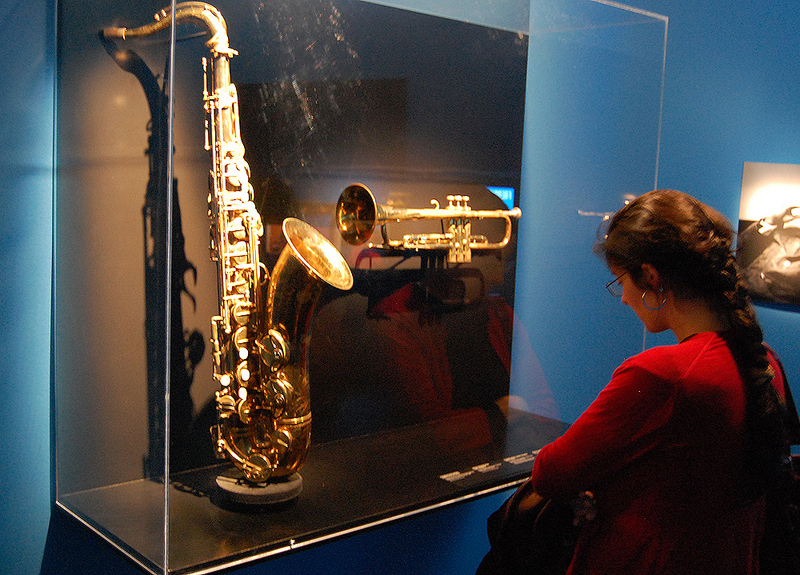 Rita checking out a tenor saxophone used by John Coltrane alongside of trumpet used by Miles Davis. Official image from museum website. Several monitors show clips and interviews. 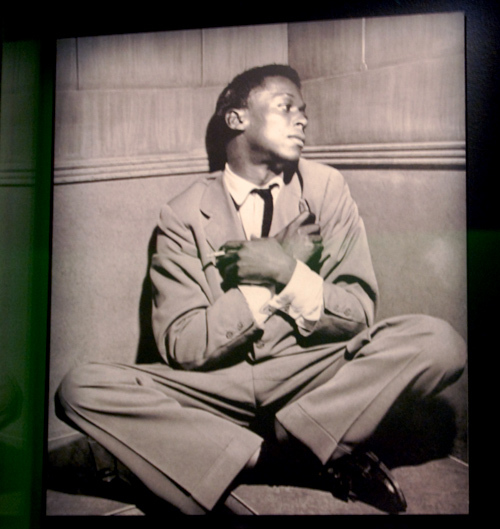 Huge image of Miles at the exit before passing through a gift shop. Packed house with music and drinks. 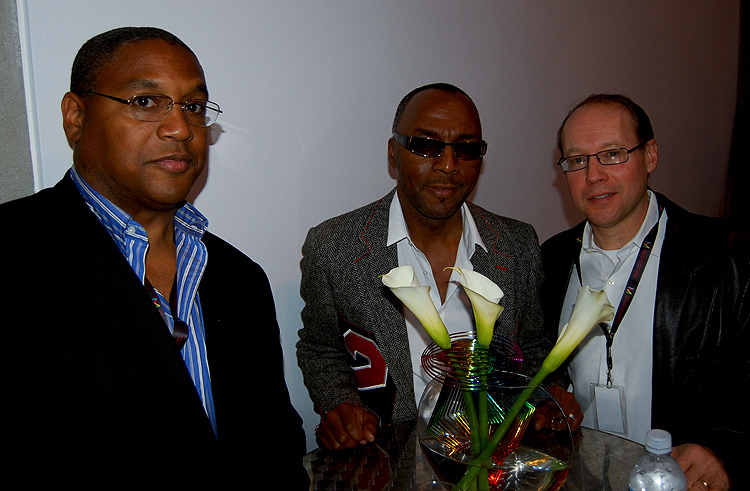 Representatives of the Miles Davis estate and their tax attorney form part of the megashow entourage. 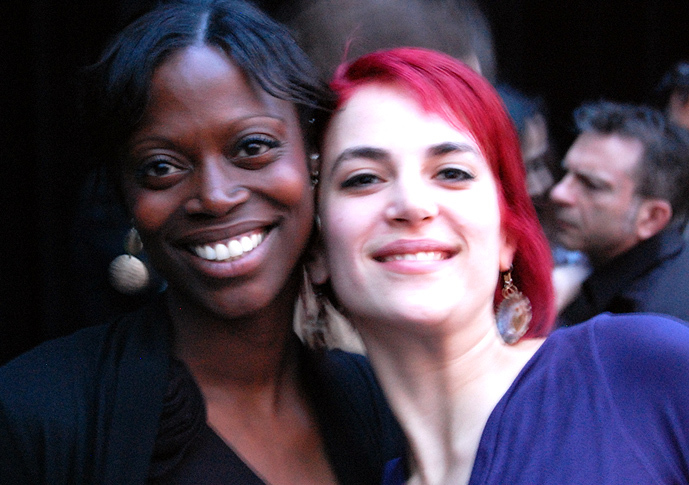 Beautiful women working with the DJ. The next generation keeps on playing. 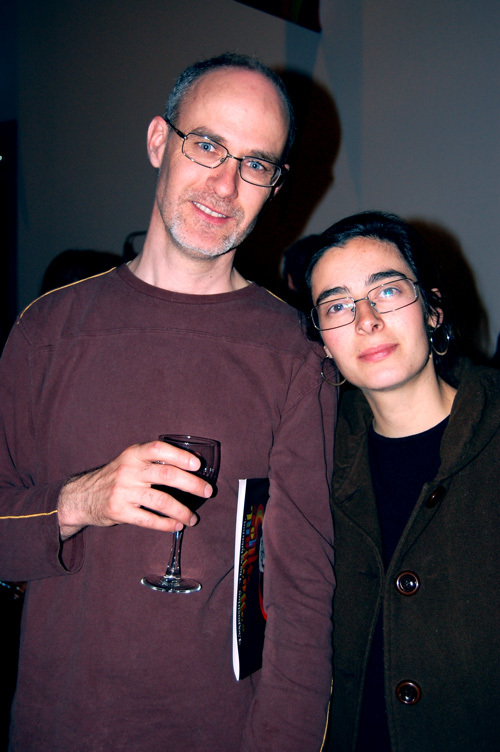 A young couple enjoys the opening with a glass. Guess who? ...while other press goes out on the Miles show in Montreal. Chaque jour les choses s’améliorent un peu. We Love You Miles . Beautiful work! Looks like it was a great art opening. Great post! Thanks for sharing and for so many pics. It really put me there – and made me jealous …. By the way, if you click on my images above some are double the size. Excellent critique Mark, thanks. Brought back a lot of memories. 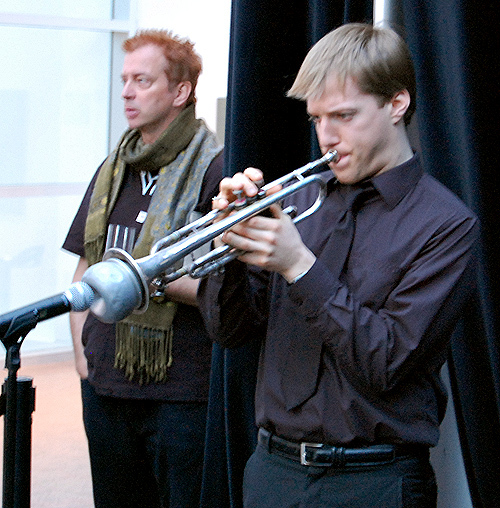 Most of my life has been spent with and around musicians of all genres; jazz, blues, pop and folk. My late husband was a musician who drew and painted what he called ‘doodles’. Quite sophisticated really, but it was a way to relieve the stress of performing and writing, especially touring. Most of the musicians I know also draw and paint as a ‘secondary’ art form, augmenting their music. 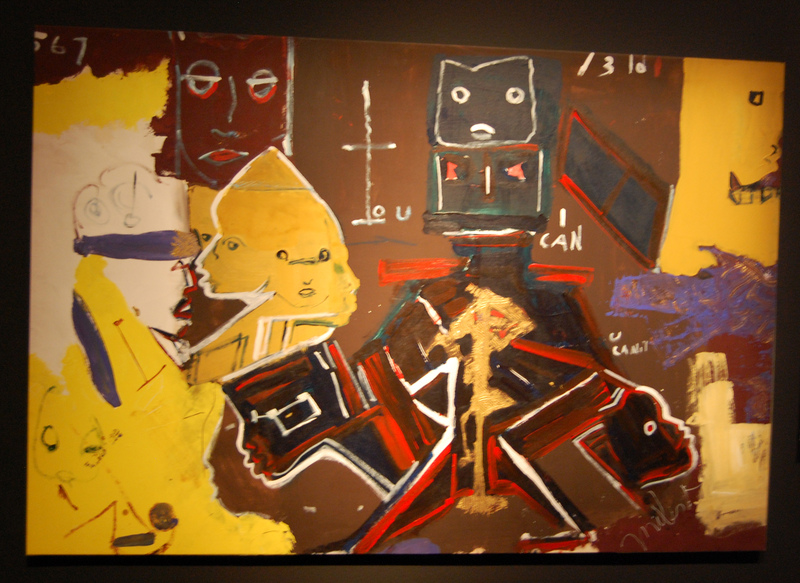 When you say that Miles Davis’ visual art is a bit superficial, you are probably correct. It can take years of dedicated study and discipline as you know, to really get a grasp on Art in the visual language. Probably these came in second to his music, and even if derivative they are pretty cool. I just imagined him on a tour bus ‘doodling’. 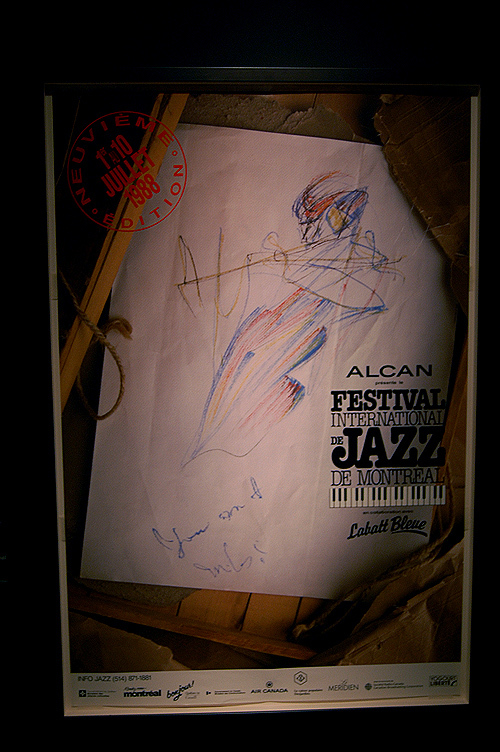 As I recall, Chick Corea doodles a bit too. 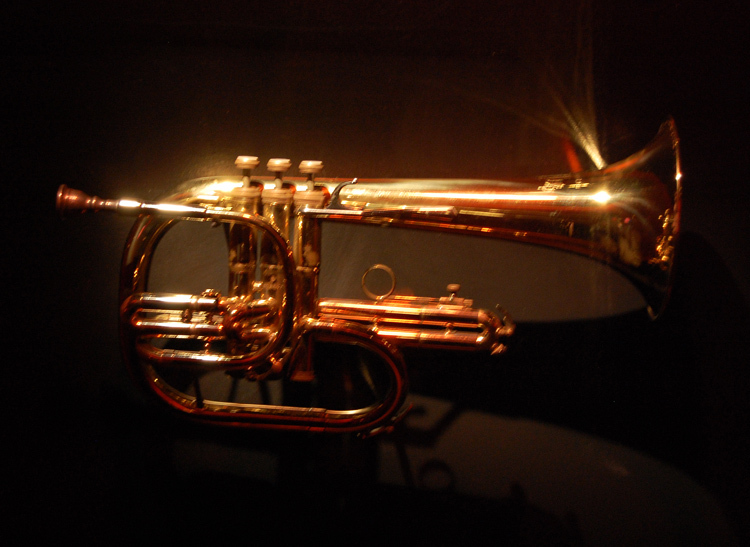 …..and oh, the music – magnificent. Again, thanks for posting this. Am too far away to go to the exhibition, but you have made it available. I appreciate your comment and opinion on the relationship between the actual painting and drawings and what it meant to miles. You mentioned ‘poorly explored and suerficial’. I tend to agree from the pics in your post. My thought is that maybe Miles needed another outlet creativly speaking, so painting and drawing helped him think about his music. Maybe when he was stuck he painted to get inspiration. I’m glad Miles did paint and draw. I just think its a shame he wasn’t able to take it further. He did how ever understand something about applying music to the visual images of film in a way that shows incredible sensitivity to the visual, and I wonder why that didn’t carry over further to the drawing and painting. Having said that, if you can manage to see the show, its well worth it. Yes, Ascenseur pour l’echafaud is pretty fabulous. What do you think about my comments at the end wrt to music and visual art for Miles? Awesome! 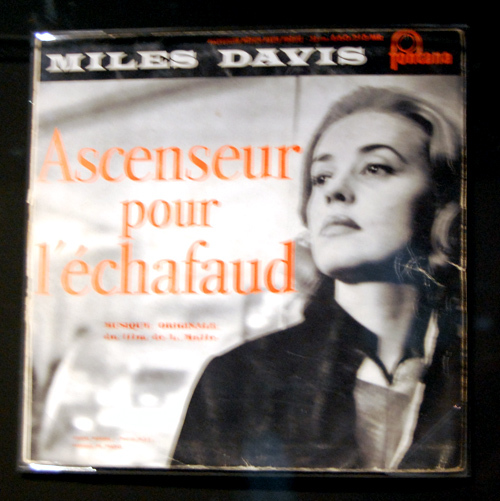 You have no idea how much I love the Ascenseur pour l’echafaud soundtrack. Great post, Mark. This is my favorite thing you’ve ever done aside from #MailArt (1). Surya Source by Stacey C.